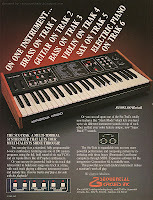 Sequential Circuits Inc. Six-trak synthesizer "Lets your multi-talents shine through" full-page colour advertisement from page 54 in the June 1984 issue of Keyboard Magazine. But, I did take some time out of my Reason-a-thon to get a blog post done. Here we have SCI's next phase in the promotion of their Six-Trak synthesizer. 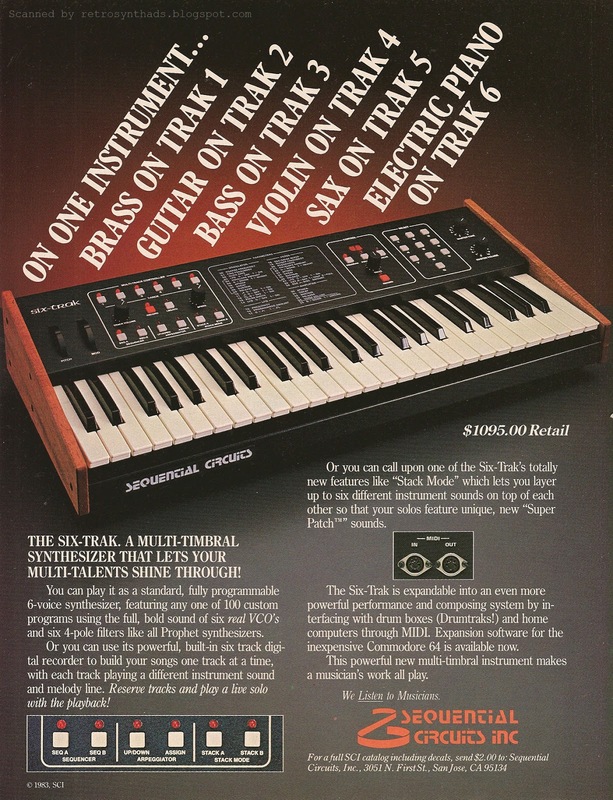 The company had spent the previous few months promoting the synth as part of the "Traks" system - but the synth was in need of some good solo ad time. It deserves it. Sequential Circuits could have taken the easy way out and reused the ad-copy from the original two-pager (it was great ad-copy! ), but instead decided to shrink it all down considerably to make room for that one big honking photo with the ad-copy above it. 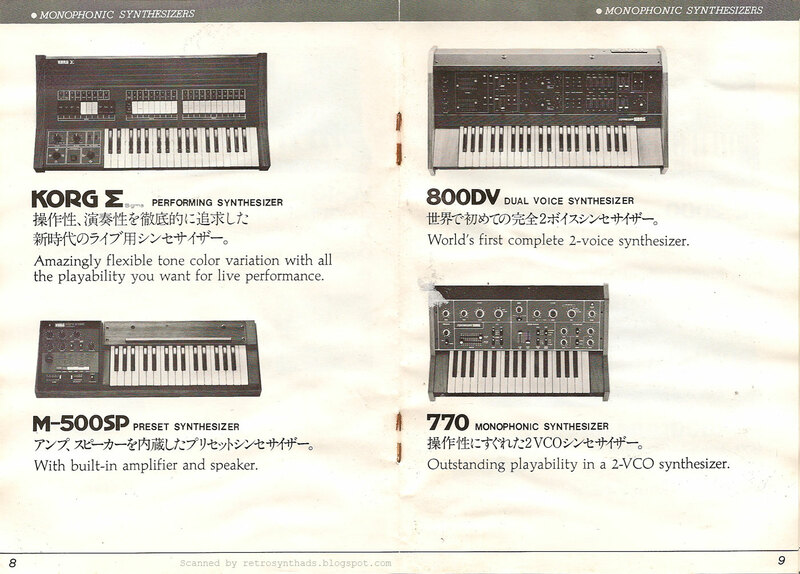 And for good reason - it was promoting the best (and most obvious) thing about the synth - six individual synths! Yummy. The big text above the photo that focuses on the instrument tracks is almost too big. 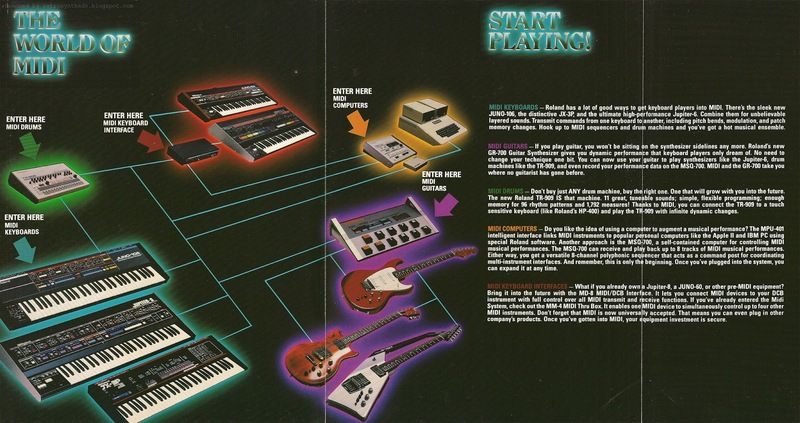 But I don't care because that diagram is worth a thousand words, and lets the rest of the ad-copy focus on the other three reasons to buy a Six-Trak - Sequencer, Arpeggiator, and Stack Mode. They even include a small photo of the front panel buttons. Awesome. And adorable. 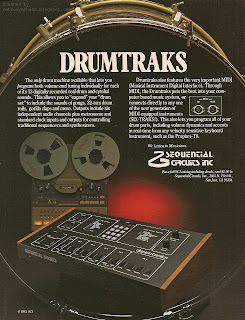 Interestingly, even though SCI does mention the other two products in what was originally referred to in the previous 2-page centerfold ad as the "Traks Music System", only one gets mentioned by name - the Drumtraks. 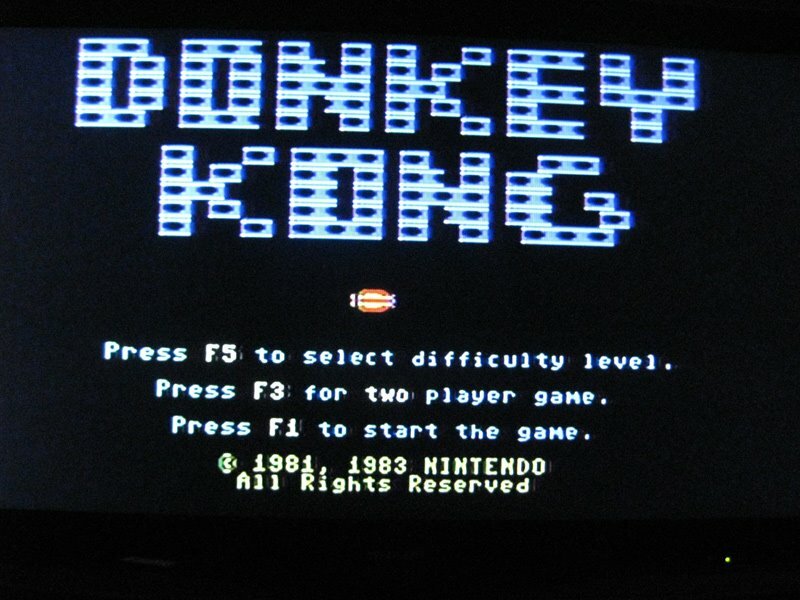 The Model 64 cartridge is only referenced as expansion software. I'm beginning to think the 'Traks" system's day is pretty much done. 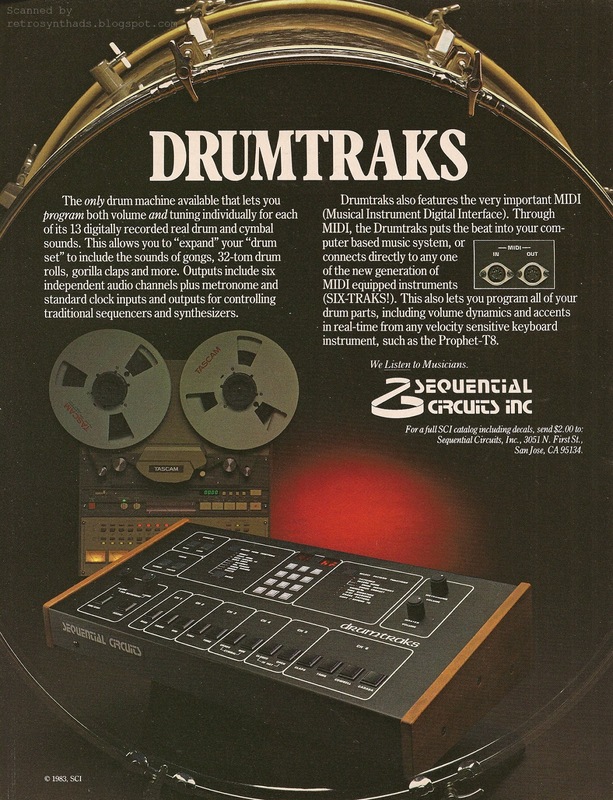 Oddly, although it is the Model 64 that gets the shaft in this advertisement, a few months before, the Six-Trak Spec Sheet promo gave the shaft to the DrumTraks, with just simple mention, while giving the Model 64 a few lines of its own promo space. 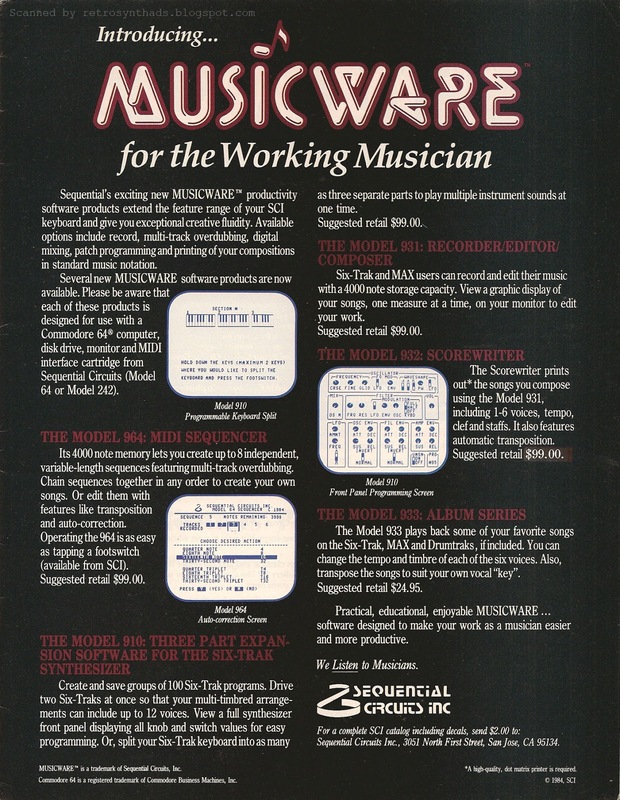 The Model 64 got its own Spec Sheet a month or two previously, but I guess it still makes sense to push it a bit in this Spec Sheet since it does offer program storage and increased sequencer storage. "SCI synthesizer. The Six-Trak is a multi-timbral polyphonic synthesizer that allows you to play six completely different instrument sounds at one time, either by layering up to six sounds on one key or by addressing those sounds with the on-board multi-track sequencer. Sequencer functions include record, playback, programmable playback speed, programmable track volume changes, variable resolution error-correction, track duplication, and over 800-note storage capacity. 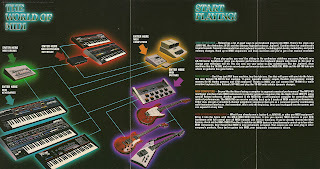 You can also combine live playing and multi-track sequencing. The synthesizer section of the instrument provides six voices, each with its own VCO and VCF. There are also three ADSRs per voice, for controlling oscillator frequency, filter cutoff frequency, and amplifier gain. Up to 100 programs can be stored in memory. Parameter values are edited with a single knob, parameter number and value being indicated by LED readout. Pitch and modulation wheels are supplied. The unit is also MIDI-equipped and can be linked to SCI's Model 64 MIDI sequencer and Drumtraks programmable drum machine. The Model 64 sequencer offers increased sequencer storage (4,000 notes), program storage on cassette or disk, sequence transposition, alternate keyboard modes, and forthcoming music display and editing functions. Sequential Circuits, 3051 N. First St., San Jose, CA 95134." Poor Drumtraks - the most expensive of them all - and yet just the briefest of mentions. It deserves some me-time as well. And it will get it in the next blog post! 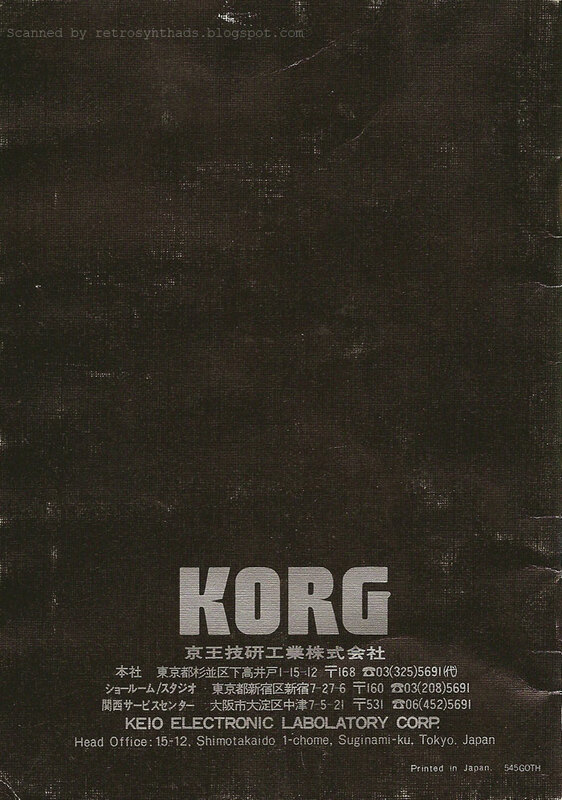 Korg 1979 (?) 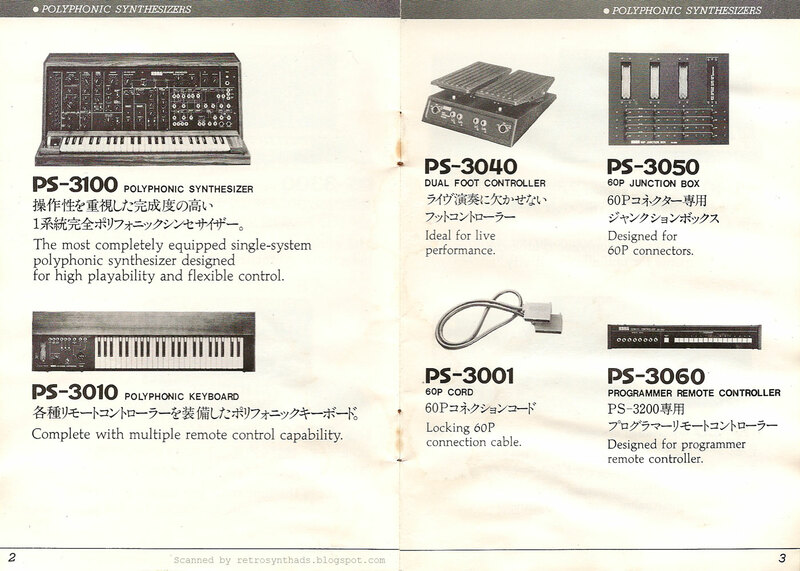 General Catalog featuring PS-3300, PS-3200PS-3100 and PS-3010 polyphonic synthesizers, PS-3040 dual foot controller, PS-3050 60p junction box, PS-3001 60p cord, PS-3060 programmer remote controller, MS-10, MS-20,MS-50, Korg Sigma, M-500SP, 800DV, and 770 monophonic synthesizers, SQ-10 analog sequencer, MS-03 signal processor, MS-02 interface, MS-01 foot controller, VC-10 vocoder, PE-2000 and PE-1000 polyphonic emsembles, KA-180 keyboard amplifier, V-C-F effects, Mr. Multi effects pedal, SE-500, SE-300 stage echos, EM-570 echo mixer, SP-2035 speaker system, SM-20 Doncamatic Stageman, Mini Pops 120W and 120P, Mini Pops7, Mini Pops45, Mini Pops35, Mini Pops Junior, Korg Quartz tuning fork, WT-10A and GT-6 guitar tuner, RT-10 rhythm trainer, FK-3 2-channel volume pedal, FK-1 VCF pedal, Type S foot swtich, Type J foot switch, cords, hard cases, soft cases and stands. Well... that was a mouthful. 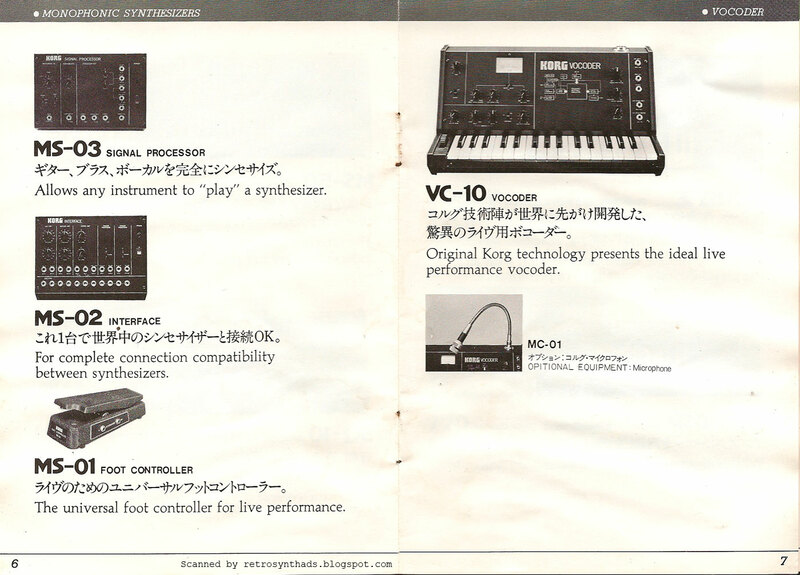 I've posted a few vintage Korg general catalogs, including this one from 1984, and this cooler one from 1982, but the one I'm posting today is really really special. This little mini-catalog only measures about 4"x5", but it holds a big space in my heart. And it also holds a wack of juicy vintage Korg products. Unfortunately I couldn't find a print date, but based on the gear promoted (and more about what wasn't promoted) I came to the conclusion it was probably printed in early 1979. 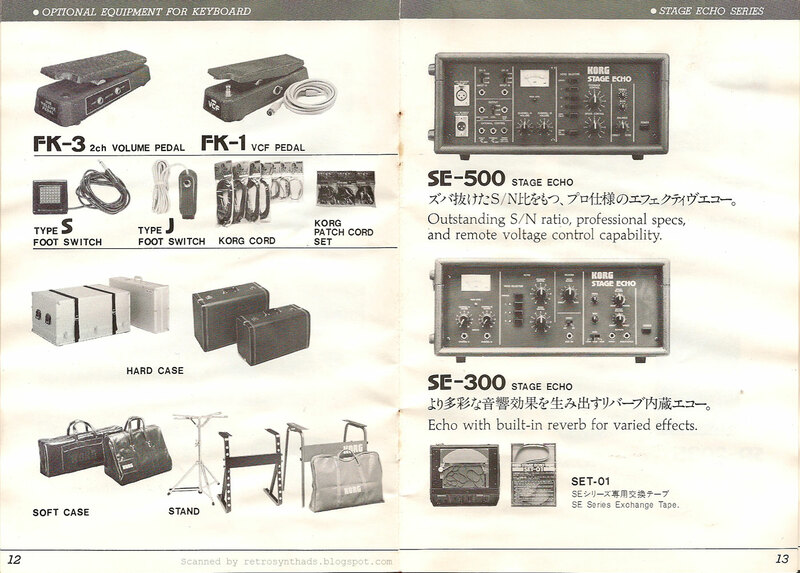 For example, gear released by Korg in 1980 (according to Vintage Synth Explorer's interactive timeline) such as the Korg Trident and X-911 are not listed in the catalog. 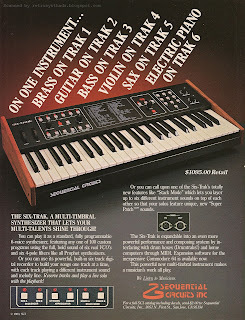 But the Korg Sigma, released around 1979, is included. 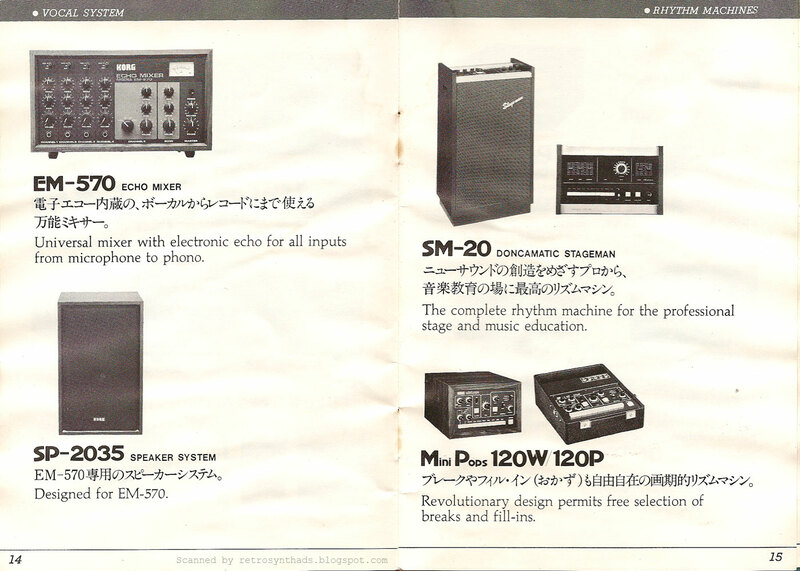 Interestingly, other Korg gear released in 1979 like the Lambda and Delta are not included either. Which is why I considered an early 1979 print date for the catalog. The catalog is tattered and worn - water-damaged to the point that the staples have left rust marks around the binding. But I still treasure it. And I knew that eventually an occasion worthy of such a celebratory posting would finally present itself. So, what exactly am I celebrating, you ask? 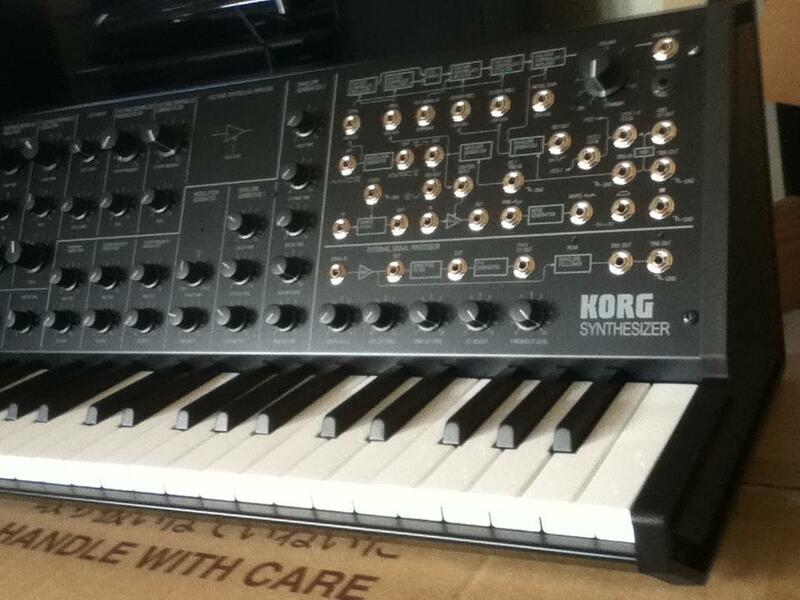 The arrival of my Korg MS20 Mini! 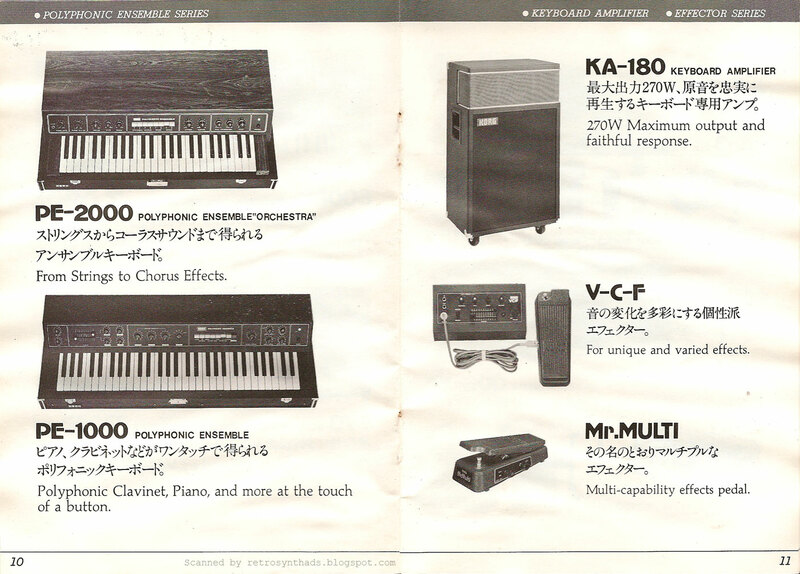 You might recall that I also celebrated when Korg first announced the perfectly replicated MS20 Mini last January at NAMM, when I posted a lovely (and in much better condition) Korg MS-10/MS-20/SQ-10 brochure. As time went on after that announcement, rumors of short supplies and slow pre-order deliveries only made me want one more. And made me think that an early possession date was probably not going to happen. My wishing apparently paid off, because it was with great happiness and surprise that one happened to land in my lap last week. And luckily it fits very nicely on my lap because that is where it will continue to sit until I can find time to rearrange my studio to fit it in. It's small, but not that small. 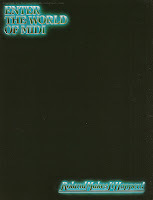 There are a lot of great things about this mini-catalog. First and foremost, it makes all the products in the catalog look... well... mini. 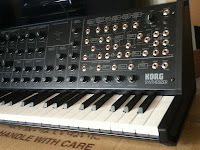 Just like the adorable new Korg MS20 Mini (did I mention I already got mine? :). And I can only hope that there are more Korg Mini products on the way. 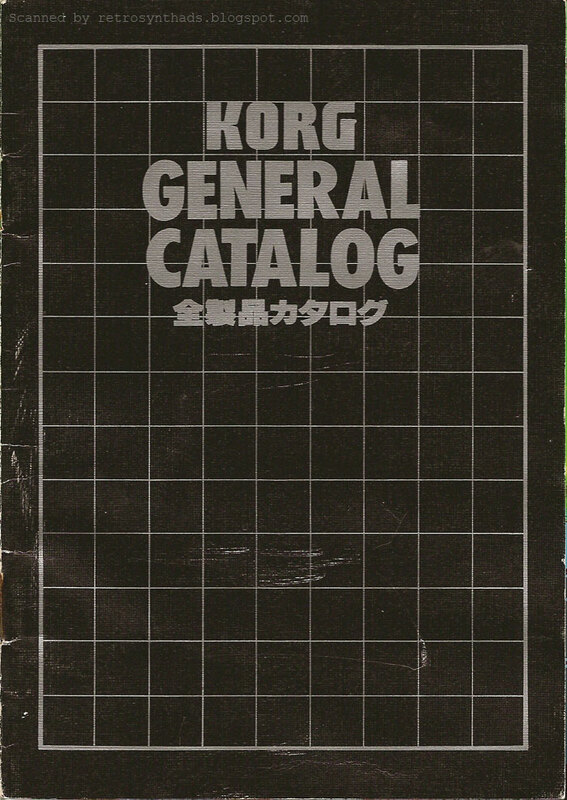 Another reason this catalog is fantastic is that it is bilingual - English and what I'm gonna guess is Japanese. Very unique. 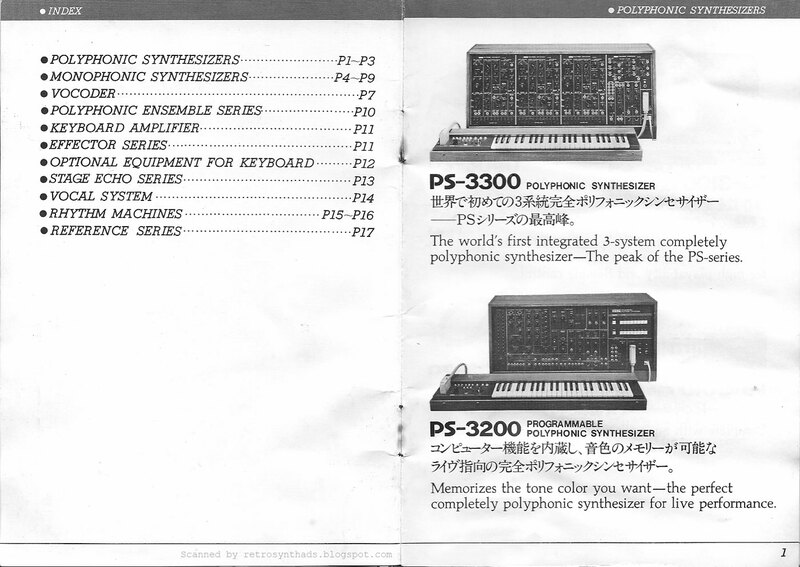 The products in the catalog are split up into logical sections, including my favorites - the poly synths, the mono synths (including the original MS20 of course!) and the rhythm machines sections. It's that rhythm machine section that peaks my interest the most. I've had the opportunity to play on some of those Korg synths, but all of those Mini Pops rhythm machines have continued to elude me. My curiosity with drum machines in general is usually a good eight out of ten, and these Mini Pop machines push it to eleven. The real problem is that older drum machines are like a drug - they are relatively cheap compared to vintage synths, and take up a lot less room in the studio. My growing drum machine collection is proof of my addiction. No, its not anything near Moby-scale [yet! ], but lets just say there has been more than few vintage drum machines popping up locally for very reasonable prices. Can't turn that down. I honestly didn't even realize the Mini Pops series was so varied until I had finally come across this catalog. I thought there was maybe one or two different machines, tops. Not six. And many of the series are quite different from the others in looks (mmmm... wood panels) and sound. 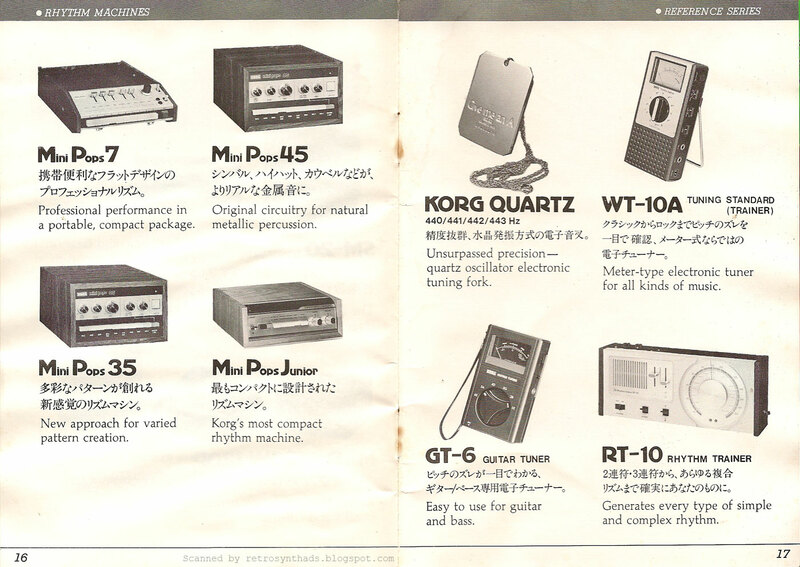 The catalog, in particular, makes the Mini Pops45 sound intriguing: "Original circuitry for natural metallic percussion". One day I'll finally get my hands on 'em. Sequential Circuits Inc. Model 64 Sequencer "The $195.00 Sequencer" full page black & white advertisement from page 13 in the November 1983 issue of Keyboard Magazine. 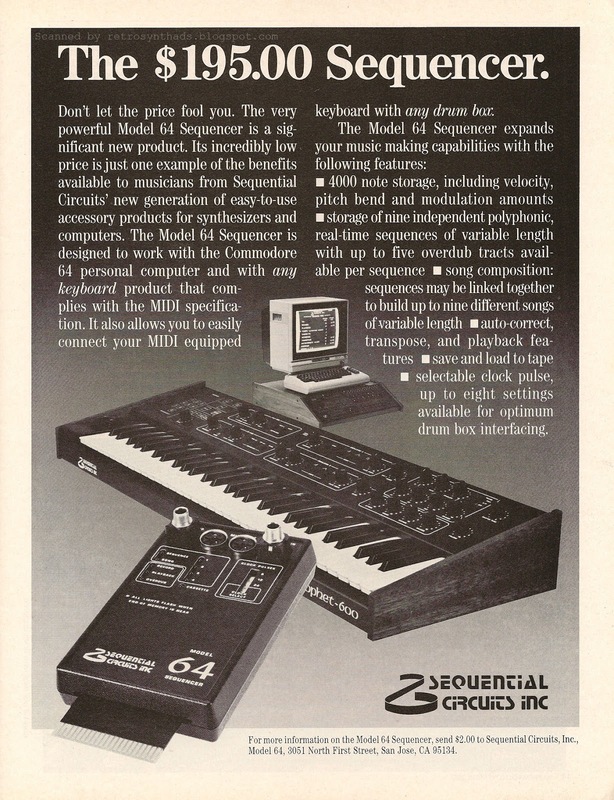 I do recall that one of the first MIDI systems I ever saw running was a Model 64 with a Commodore 64. I hardly remember anything about that system except the small dark brick sticking out of the computer with MIDI cords attached. It was cool, and I was definitely hooked as soon as I saw it. 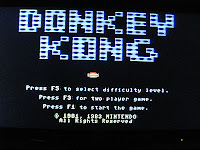 My first computer sequencer was Master Tracks running on an Apple IIe - I had to borrow money from my parents to pay for it. Then, when I finally upgraded to a Mac IIci, I purchased MOTU Performer 3.61 which soon became 3.64. Then at work I had to learn Twelve Tone System's CakeWalk Dos, and then an early Windows version. Since then, I've never really left CakeWalk and would probably be considered one of those outspoken Sonar users everybody hates to be in a room with. I will admit I also have licenses for ReNoise, Reason (just ordered 7!) and a few other sequencer packages, but I usually end up powering up Sonar for the heavy lifting. Alas, there was no MIDI software or hardware included in the box that showed up on my door step. 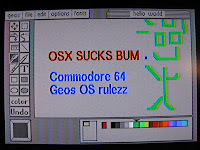 And so I wait... and wait... and wait... for a reasonably-priced Model 64 or similar Commodore 64 sequencer to come my way. 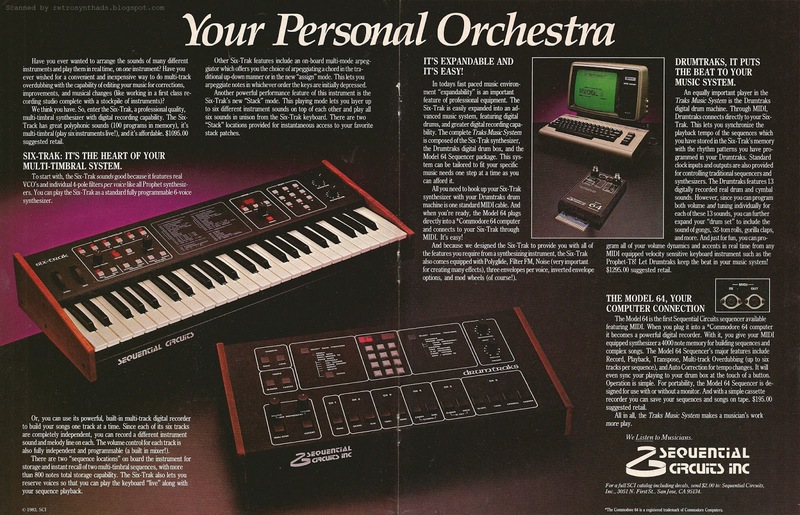 I would even consider the original $195.00 price tag featured in the title of this advertisement a reasonable price to pay for the enjoyment of again seeing a Commodore 64 MIDI system in action. 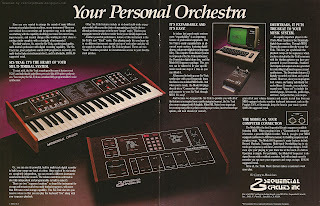 And I'm guessing that if you are musician that already had a Commodore 64 and a Prophet-600 synthesizer, $195.00 probably wasn't going to blow the bank account either. 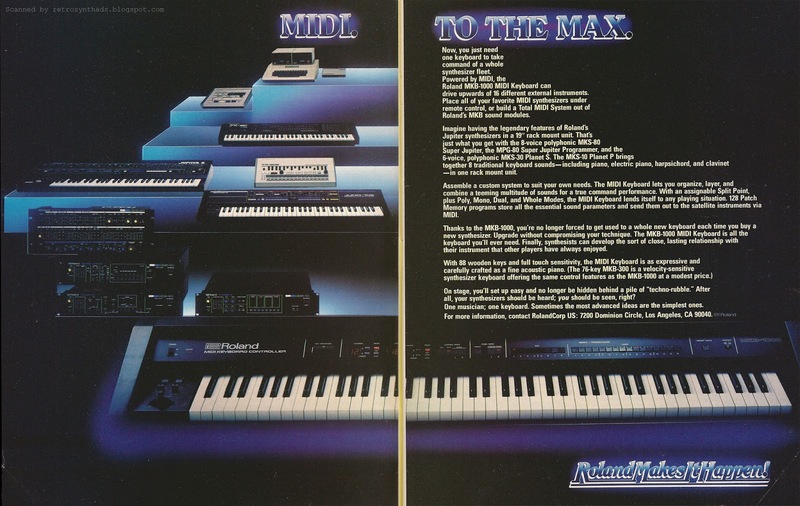 The ad-copy provides us with a great glimpse into the early history of one of the major forces behind the development of MIDI - Dave Smith and SCI. 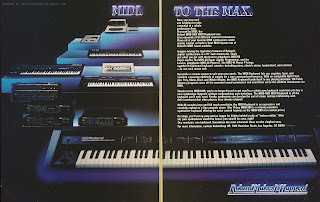 Even nine months after the SCI launched the first commercial MIDI synthesizer, the Prophet-600, the whole idea that there was now this one musical standard available called MIDI that *any* manufacturer could build into their products to connect directly to other manufacturer's products was still very alien. So, what did an early computer-based sequencer get you? 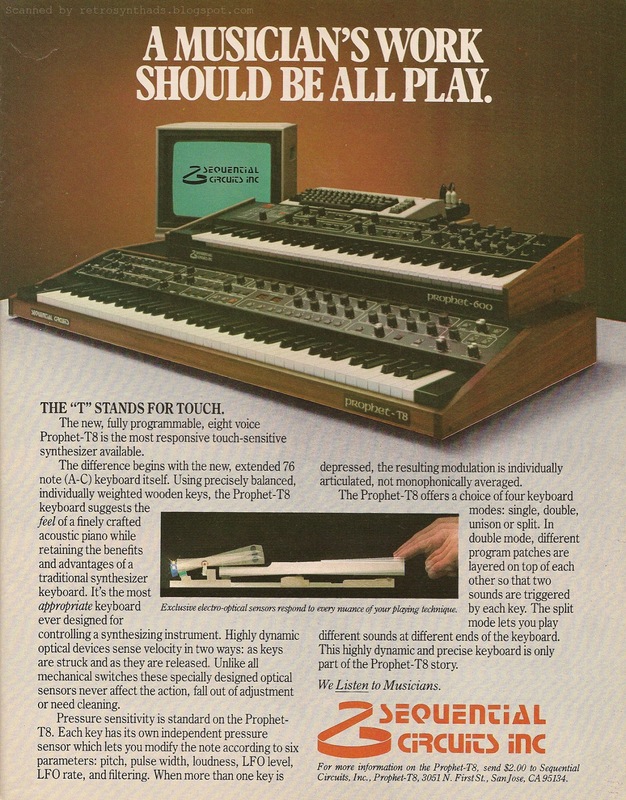 Although a rare beast in 1983, by 1987 the computer-based sequencer was firmly catching on, and a flourish of products had became available. For the Commodore 64 alone there was Moog's Song Producer that used the Moog Manybus MIDI interface, MIDI/8 Plus by Passport that used its own interface, Keyboard Controller Sequencer by Dr. T's Music software that used its own interface, and Studio One by Syntech Corp that used MIDI interfaces produced by Syntech themselves, as well as Dr. T's, Passport, Sequential or Yamaha. 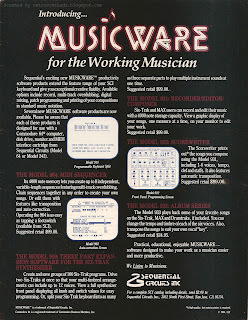 But sequencers weren't the only MIDI programs available. 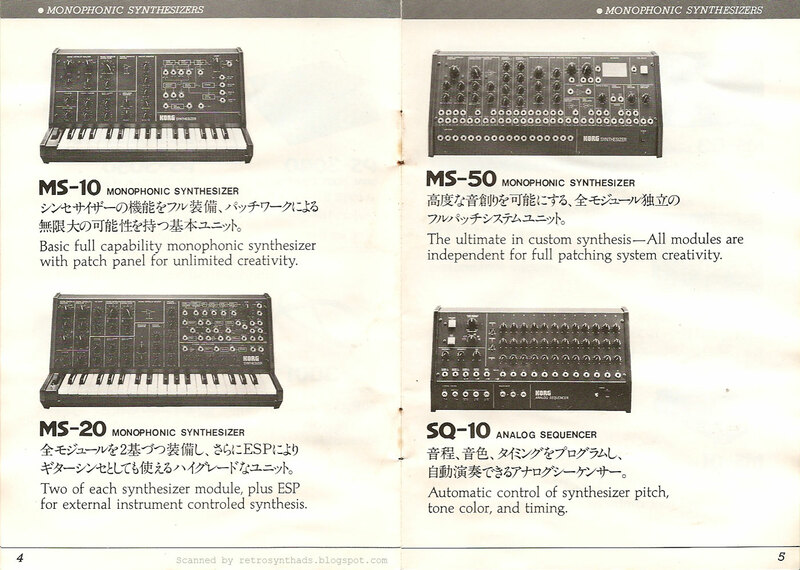 A number of MIDI patch librarians for DX/TX and CZ synths by many of the companies already mentioned above became available by 1987. 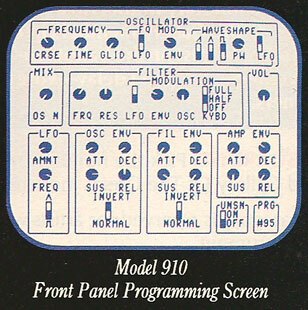 There was also algorithmic MIDI composers, MIDI echo/arpeggiators, MIDI filters/channel-reassigners, and even a mini-sampler called Sound Sampler by SFX Computer Software Commodore Business Machines Ltd. that included a microphone and 1.2 seconds of sampling. 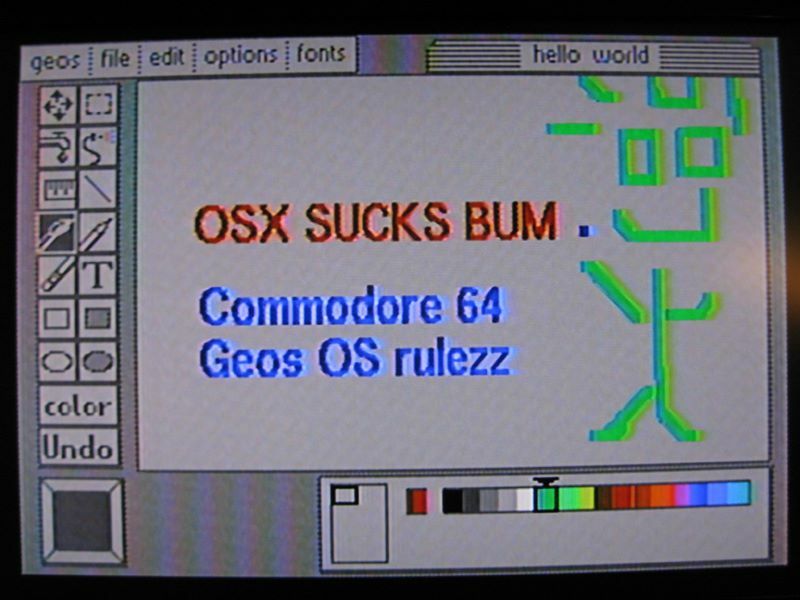 And that's just for the Commodore 64. Hardware and software for the IBM PC and compatibles, Apple Macintosh (Performer - yay! 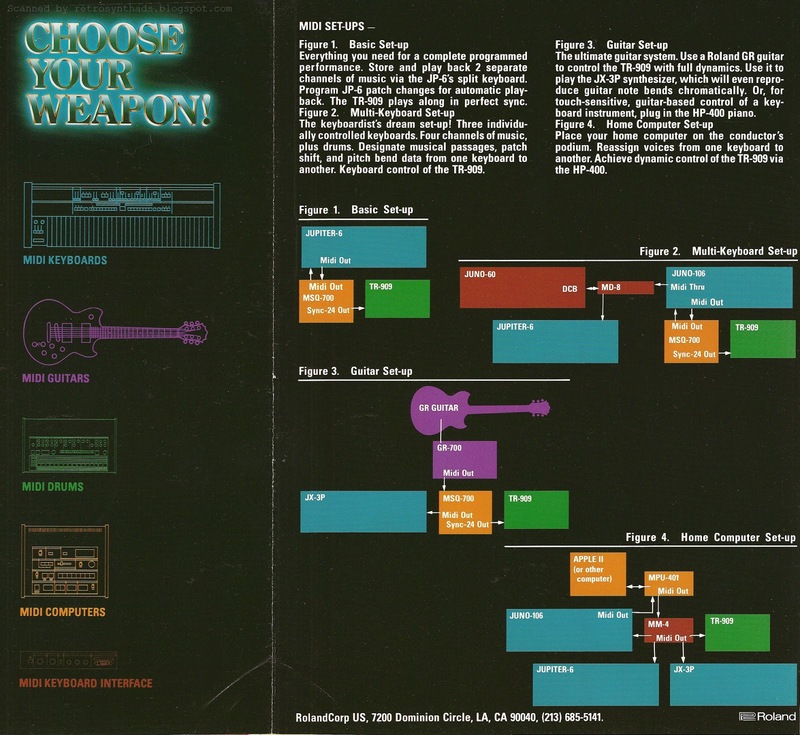 ), Apple II, Atari ST and even the TI 99/4a were also out of the gates and getting into the hands of computer musicians. Why do I know this? Not because I saw all of these programs in action. But because a long while back I was lucky enough to be given the 1987 book "The Complete Gudie to MIDI software" by Howard Massey and the staff of PASS (Public Access Synthesizer Studio) in New York. If you are into retro computer MIDI software, definitely search out a copy. While I'm waiting for a vintage Commodore 64 sequencer (hardware and software) to come my way, I have to say I am quite curious about the more recent MSSIAH MIDI SID hardware/software from 8bitventures.com. It looks like it could keep me busy while I wait. Yup. Gonna have to order it. Right after I'm done with this post. Which is now.